Hertfordshire Partnership University NHS Foundation Trust encourages staff and anyone using the Trust's services to walk, cycle or use public/community transport where possible as a way of benefitting health and well-being and reducing carbon emissions. As part of the personal recovery plan provided by the trust for each user of their services, the Trust look for ways of promoting healthy exercise and independent travel wherever possible. Many service users find that they can benefit from exercise such as walking or cycling. Currently there are a high percentage of people travelling to the Trust's services by car and the Trust wanted to find a way of providing information on how to travel by public transport. Hertfordshire Partnership University NHS Foundation Trust approached Pindar Creative after seeing the Area Travel Guides publicity produced for Hertfordshire County Council. 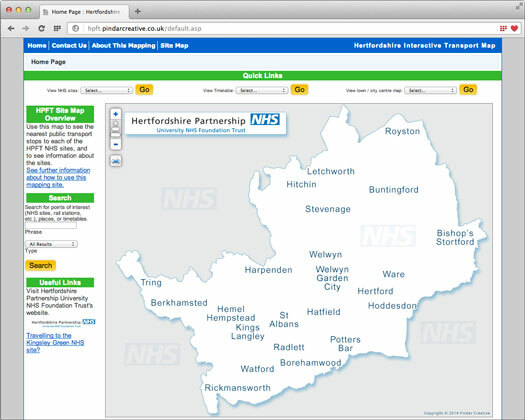 We were asked to develop an interactive online version of the map aimed at increasing the number of patients travelling to the Trust's locations by public transport. Our solution included three levels of pan-able mapping, including an overview map, county map and detailed town level mapping. A link to this website will be provided on all correspondence to users of the Trust's services, ensuring they can make an informed decision on how to travel. For the first time anyone using the Trust's services will have access to bus timetables, live arrival/departure information for rail stations and mapping information which is all available from one user friendly source online. The main aim of the site is to increase the number of visitors travelling by public transport which will contribute to a greener local environment by reducing carbon emissions and help to benefit the health and well-being of those using the Trust's services. "The mapping database provided by Pindar has greatly helped our service users and carers find the key routes to our Trust sites and the detail the site shows gives our customers more choice in the services they choose. This mapping web site easily interlinks with our Trust website and is very flexible when we need to add extra information to it "